Illumina (ILMN) is a healthcare technology stock that has treated us very well, a $10.5K gain since inception in December 2007. However this is a case example of a stock the bear has finally found, and has not been participating with the general healthcare space. It is very expensive but that has not stopped it in the past. We like this name and we'll revisit it later - but that appears to be a double top I spy (hence making it a short from a technical perspective until proven otherwise). 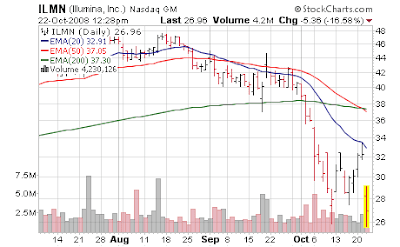 Today the stock is down in the $26s or 38% lower. Nothing to crow about since nearly everything is down 40% since early September. Until I figure out why exactly this earnings report in which they RAISED guidance is causing such a firestorm I am reticent to make a large purchase (this is one of those times I'd like to have access to analyst reports for their take on the quarter). It is a bit of a confusing report due to all the one time charges but on the surface I didn't see anything horrific. They do have a monster stock compensation charge which is unsavory but status quo in America. But excluding the 50,000 one time charges they did a 22 cent quarter versus analysts 16 cents. For the third quarter of 2008, Illumina reported revenue of $150.3 million, a 54% increase over the $97.5 million reported in the third quarter of 2007 and a 7% increase over revenue of $140.2 million in the second quarter of 2008. During the third quarter, the Company completed its acquisition of Avantome, Inc. As part of the acquisition, the Company recorded a charge of $24.7 million associated with acquired in-process research and development. As a result, the Company recorded a GAAP net loss of $7.3 million, or ($0.06) per basic and diluted share. Also included in the GAAP net loss were non-cash charges of $12.7 million in stock compensation expense, (boo hiss) $2.7 million associated with the amortization of intangible assets and $0.6 million of accrued contingent compensation associated with the acquisition of Avantome, Inc. Excluding the impact of these specified items, and net of pro forma tax expense, Illumina’s net income on a non-GAAP basis for the third quarter of 2008 was $28.6 million, or $0.22 per diluted share, compared to $19.9 million, or $0.17 per diluted share, for the third quarter of 2007. Gross margin in the third quarter of 2008 was 62.0% compared to 61.3% in the comparable period of 2007. Non-GAAP gross margin was 64.6% for the third quarter of 2008 compared to 63.1% in the prior year period. Non-GAAP gross margin for the third quarter and the prior year period excludes the effect of the amortization of intangible assets and non-cash charges associated with stock compensation. We expect revenue for 2008 between $564 and $568 million, representing year-over-year growth between 54% and 55%. This represents an increase of $11 million from the midpoint of our previous guidance. We expect our gross margin percentage to be in the mid 60s. We expect earnings per fully diluted share between $0.84 and $0.87. For the fourth quarter of 2008, we expect revenues between $152 and $156 million. We expect gross margin percentage to exceed 65.5%. We expect earnings per fully diluted share of $0.22 to $0.24. So analysts expected $153M and $0.18 in Q4; the company is guiding for $0.22 to $0.24 on inline revenue; 4 to 6 cents higher. For the full year, analysts expected $562M in revenue and $0.63 EPS and the company is guiding for in line revenue and $0.84 - $0.87. Thats a full 21-24 cents higher. Yet the stock is being pole axed. Color me confused. Technically we have what could be a nice double bottom forming IF $26 holds. If not, we have a disaster. Upside is probably limited for now to low to mid $30s but this is our favorite sector at this time, and we'll see if $26 holds - if not we'll lighten our exposure. I hope to see more clarity on why analysts think the stock has been punished like this - obviously I am missing something. This is the cheapest I've seen Illumina in many years of following this name; it has always been extremely expensive and even now is not "cheap" - just much cheaper than usual. But I'm saying that for almost every stock nowadays. We restarted this with a 1.5% stake in the upper $26s - if I knew what exactly the reason for the negative reaction I'd have a larger stake but since I might be missing something, I don't want to overextend until I find out what the fuss is about. Usually these earnings related sell offs are not one day events, so we'll see how it handles the next few days.